Has the “real live experiment” in Kansas tax policy been a success? Did it live up to its billing? If we simply judge whether it met publicly stated objectives, then no, the plan failed miserably. But in another important respect, the plan achieved exactly what many lawmakers hoped for, the squeezing down of state government. 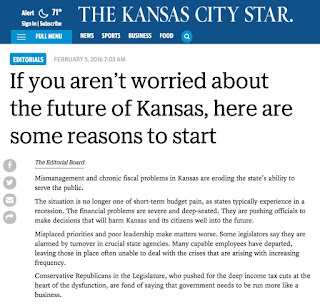 Recall claims from four years ago when Kansas decision-makers dramatically lowered income tax rates and exempted more than 300,000 individuals from paying any tax on “business income.” Citizens were told to expect a “shot of adrenaline right to the heart of the Kansas economy,” a shot so potent, that despite tax cuts, the state budget would still balance. After implementation of the tax cuts, all of that adrenaline talk soon turned sour. Sure, Kansas has grown economically coming out of the Great Recession, but slowly. More slowly than our region, and more slowly than the nation. In new job creation — a key measure for this experiment — Kansas ranks among the lowest 10 of all 50 states. Economic indicators show no correlation that the tax cuts helped Kansas boost its economy. And state finances? What a mess. The revenue loss from the income tax cuts put the state budget drastically in the red. In response, lawmakers raised sales tax rates twice, which transferred more of the state’s tax burden to low-income Kansans but did not come close to correcting the budget imbalance. Lawmakers also blew through the state’s reserves and transferred hundreds of millions away from highways and children to barely eke out a budget. But therein lies the secret to the “success” many lawmakers really sought. If you want to cut programs and force state government to be smaller, starving the revenue stream provides the easiest route. Indeed we do. In Kansas, if the general fund bank account has no money, then no spending can take place. At the federal level, the “starve the revenue” approach does not work as effectively because the federal government has the ability to run up deficits and borrow money to fill the gap. Kansas cannot do that, at least not directly. So in the name of “living within our means,” lawmakers cut operational aid for schools, then froze funding in place through block grants. State employees have lost benefits, and received no raises in 8 years, leading to critical staff shortages at state hospitals and prisons. Maintenance on roads and bridges has been chopped, services for low-income Kansans cut off, Medicaid expansion turned away, and the Bioscience Authority demolished. And it will get worse. Kansas cannot even afford the current scrunched-up level of spending. This year’s budget only balances by using large one-time transfers from other funds. All budgetary efforts now focus on downsizing and cutting back, with little thought given to how our state should invest for a better future. Evidence shows up everywhere that the tax plan fundamentally failed to provide sound finances or deliver economic prosperity, but the governor and supporters of the tax plan brush it off. Maybe they disregard the evidence because they don’t care. After all, it appears that the real goal of Kansas tax policy went undisclosed at the front end. The architects of this plan may well be pleased with reductions of services to the state’s citizens. If you truly bought into the argument that giant tax cuts would lead to prosperity without hurting schools and highways, you’ve been had. Meanwhile, those wanting Kansas to spend less, regardless of the consequences, have met success. — This column originally ran in a variety of Kansas newspapers over the weekend. Kansas lawmakers paid $2.6 million for a 257-page, recently released efficiency review of state government. What should we make of it? The most important section of the report—budget process review—tells lawmakers to structurally balance the budget (recurring revenue equals expenses), and establish a rainy day fund, two critical financial practices that have been completely upended in Kansas by the 2012/2013 tax cuts. Even if lawmakers implement every single “efficiency reduction,” Kansas will still not achieve structural budget balance or have a rainy day fund. $2 billion in potential savings may sound big, but that amount represents a cumulative 5-year total, a substantial share of which does not accrue to the general fund. Plus, the savings estimates for some of the components are just guesses, and likely too high. Further, items like the sale of surplus property, or depleting cash balances in school districts, produce only one-time dollars. And lawmakers will never, even in the wildest of dreams, ever implement all the recommendations. A large swath of the recommendations do not represent efficiency savings at all, just plain cuts. For example, $543 million in “savings” over 5 years, more than a fourth of the grand total, would be garnered by reducing health benefits to state employees and teachers. State employees would all be moved to a high deductible health plan. In this scheme, the state pays less and employees pay more; not a good move when the state struggles to fill positions at state hospitals and prisons. Several items actually propose an increase in spending in order to secure more revenue. Spend more to get more. Supposedly, about $50 million a year could eventually be garnered by hiring 54 new tax auditors and collection agents. If that is true, staff reductions of the last few years have seriously hurt the efficiency of the Department of Revenue, just as they have also damaged the operations of state hospitals and prisons. The review turned up some things that are worth doing—such as better coordination of insurance purchases, and energy savings ideas. Certainly state government should always work to provide the most efficient services possible with taxpayer dollars. 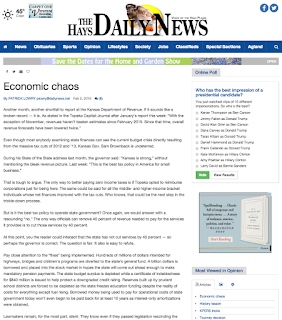 However, items that might be classed as easy or “low-hanging fruit” were already accomplished long ago as the state struggled through the Great Recession and then grappled with reduced revenue as a result of tax cuts. So, charge ahead, lawmakers. Implement every item that truly makes Kansas government more efficient. But remember that the key issue you face is not inefficiency. The 2012-2013 tax changes so damaged the state revenue stream that Kansas does not have enough income to meet even a conservative or “efficient” set of expenses. That’s the real problem that must be fixed so that Kansas can once again invest in the future. — This entry was originally posted on the Kansas Center for Economic Growth website.